LOS ANGELES—After nearly two years of detention in the Gulf country of Qatar, a Los Angeles couple left for their home in the US on Wednesday. The Huangs were detained in Qatar after the sudden death of their 8-year-old adopted daughter, Gloria, in January last year. In March, the Huangs were sentenced to three years in jail and fined more than $4,000, which they learned later was for child endangerment. The family said Matthew rushed Gloria to a hospital in Doha, Qatar’s capital, after finding her collapsed on her bedroom floor. The Huangs said Gloria suffered from an eating disorder common among children born into extreme poverty. They adopted her when she was four from Ghana. A Qatari medical examiner said she died of dehydration and starvation. Qatari police accused the Huangs of murdering Gloria by withholding food from her and said the couple’s plan was to harvest her organs or to conduct medical experiments on her. To the contrary, a US-based child forensic pathologist said that, based on the notes of the medical examiner, the cause of death was not homicidal starvation. “My professional opinion is that homicidal starvation is not supported by the available medical evidence, and appears to be refuted by other evidence,” Janice Ophoven said in a statement. Police also claimed the Asian-American couple obtained all three of their adopted, African-born children via human trafficking, however there was no evidence provided by authorities to support these claims. Matthew, an engineer who studied at Stanford University, moved to Qatar in 2012 to help oversee a major project related to the 2022 World Cup. He voiced his frustration over the Qatari judicial process to international media during an appeals court date on Oct. 20. “We continue to be trapped and we feel like there is no end to this, to this court, this court that we believe is a sham,” he said. Adoption and interracial families are rare in Qatar. 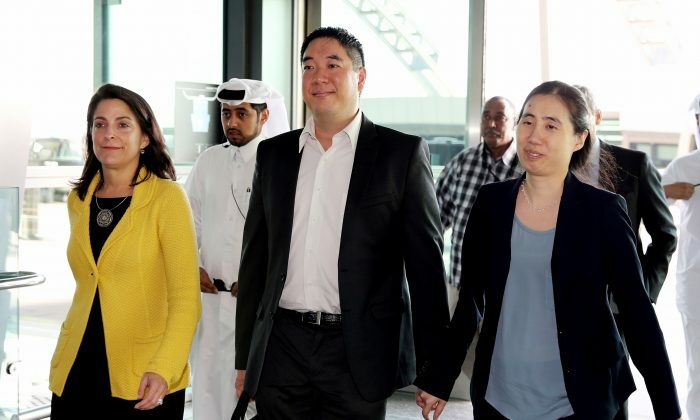 One of the organizations helping the Huangs, the California Innocence Project, believes “the case against the Huangs is rooted in transparently racial and cultural prejudice by the Qatari police,” according to their website. The Qatari appeals court overturned the conviction and declared the couple’s innocence on Sunday. However, when the couple tried to leave the country the same day, their passports were confiscated, according their spokesperson, Eric Volz, of the David House Agency. Family of the couple called on friends and acquaintances to ask government officials to intervene. Secretary of State, John Kerry, said in a statement on Sunday that he spoke to the Qatari Foreign Minister on the Huangs’ behalf. On Tuesday, he said that the prosecution would not appeal, and that the travel ban would be lifted. “The United States applauds this decision, and we look forward to seeing the Huangs reunited with their children at home,” he said in a statement on the State Department’s website. In late 2013, the Huangs’ two other children were allowed to return to the U.S. to live with their adopted grandparents.